Ministry will never be easy, but it doesn’t have to be as complicated as we make it. So, you pastor a small, struggling church. You’re trying to help it become less small and less struggling, but all the “can’t miss” answers from the latest church growth conferences never seem to work for you. You don’t have a big worship team singing new songs, a dynamic small group ministry, a trendy youth group, maybe not even a building of your own to meet in. That’s okay, you don’t need any of that to have a vibrant, healthy, effective church ministry. We make church way more complicated than it needs to be. Some of that comes from (mis)reading and listening to pastors of big churches. We see them with professional-grade musicians, lighting, graphics and self-designed curriculum and we think we need to do that, too. Big churches didn’t become big by having cool new stuff, they added that stuff when it became the best way to manage the size of the crowd. Parking attendants with matching shirts didn’t cause their growth, it was a byproduct of their growth. Complicating things is never the answer. 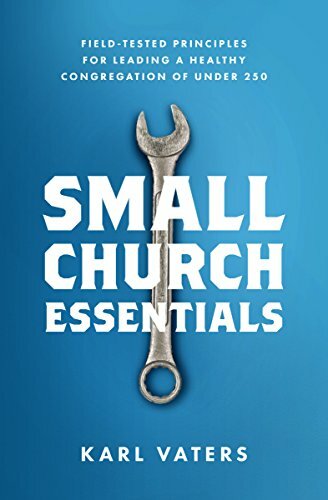 Simplifying things almost always is, no matter what size church you serve, but especially if the church is small (whatever number you consider small to be). Complicating things is never the answer. Simplifying things almost always is. Then do that. Experiment with a few ideas if you need to, but keep them streamlined and simple. Innovation doesn’t mean complication. The most innovative churches always get there by simplifying their systems, not complicating them. For example, every church growth strategist tells us we need vibrant small groups. And they’re right. Healthy churches need a strong small group dynamic to strengthen essential aspects of the faith like fellowship and accountability. But that doesn’t mean we need the latest small group curriculum or system. If you’re pastoring a church of under 50, you don’t need a small group program, you are a small group. Don’t subdivide an already-small group of people. Get everyone together for fellowship, conversation, prayer and learning. Want great kid’s ministry? Sitting on the grass, coloring on cardboard while someone who loves kids tells them about Jesus is life-transforming.